Saint Peter (Latin: Petrus, Greek: Πέτρος Petros, Syriac/Aramaic: ܫܸܡܥܘܿܢ ܟܹ݁ܐܦ݂ܵܐ, Shemayon Keppa, Hebrew: שמעון בר יונה‎ Shim'on Bar Yona; died c. 64 AD), also known as Simon Peter, Simeon, or Simōn, according to the New Testament, was one of the Twelve Apostles of Jesus Christ, leaders of the early Christian Church. The Roman Catholic Church considers him to be the first Pope, ordained by Jesus in the "Rock of My Church" dialogue in Matthew 16:18. 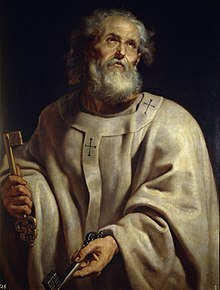 The ancient Christian churches all venerate Peter as a major saint and associate him with founding the Church of Antioch and later the Church in Rome, but differ about the authority of his various successors in present-day Christianity. The New Testament indicates that Peter was the son of John (or Jonah or Jona) and was from the village of Bethsaida in the province of Galilee or Gaulanitis. His brother Andrew was also an apostle. According to New Testament accounts, Peter was one of twelve apostles chosen by Jesus from his first disciples. Originally a fisherman, he played a leadership role and was with Jesus during events witnessed by only a few apostles, such as the Transfiguration. According to the gospels, Peter confessed Jesus as the Messiah, was part of Jesus's inner circle, thrice denied Jesus, and preached on the day of Pentecost. According to Christian tradition, Peter was crucified in Rome under Emperor Nero Augustus Caesar. It is traditionally held that he was crucified upside down at his own request, since he saw himself unworthy to be crucified in the same way as Jesus. Tradition holds that he was crucified at the site of the Clementine Chapel. His mortal remains are said to be those contained in the underground Confessio of St. Peter's Basilica, where Pope Paul VI announced in 1968 the excavated discovery of a first-century Roman cemetery. Every June 29 since 1736, a statue of Saint Peter in St. Peter's Basilica is adorned with papal tiara, ring of the fisherman, and papal vestments, as part of the celebration of the Feast of Saints Peter and Paul. According to Catholic doctrine, the direct papal successor to Saint Peter is Pope Francis. Two general epistles in the New Testament are ascribed to Peter; however, some biblical scholars reject the Petrine authorship of both. The Gospel of Mark was traditionally thought to show the influence of Peter's preaching and eyewitness memories. Several other books bearing his name – the Acts of Peter, Gospel of Peter, Preaching of Peter, Apocalypse of Peter, and Judgment of Peter – are considered by Christian churches as apocryphal. Guardian of the Catholic Church; Kiev, Guardian of Vatican City; protector of the Jewish people,police officers, military, grocers, mariners, paratroopers, sickness.